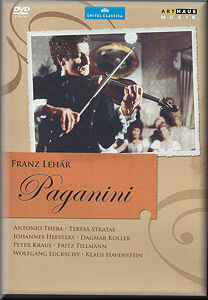 Paganini (1925) was the first of five lyrical and beautiful Lehár operettas made world-famous by the renowned Austrian tenor, Richard Tauber. They were: Der Zarewitsch (1927), Friederike (1928) and the revised Gelbe Jacke, Das Land des Lächelns (1929). This film version of Paganini is a very creditable stab at a glittering operetta allowing us to appreciate a wider view of hunting tableaux, village fetes, casinos, bedchambers and glamorous ballroom scenes with dashing hussar uniforms and gorgeous empire line ball gowns. The colour film and sound recording, from 1973, are very good. Paganini is concerned with an episode from the violinist’s colourful life when he was supposed to have met and stolen the heart of Napoleon’s sister, Princess Anna Elisa of Lucca. Paganini subsequently not only enjoyed Anna Elisa’s affections but became opera director and virtuoso violinist at the court in Lucca. Alas, always the devilish womaniser, Paganini’s eyes fall on opera singer, Bella Giretti. He loses his precious Stradivarius at the casino to the effete aristocrat Pimpinelli who also yearns after Bella Giretti. The stage is set for complications, ultimate loss and sadness. Paganini’s luscious melodies include: ‘Girls were Made to Love and Kiss’. This is nicely executed by Antonio Theba as a rakish-looking Paganini though he is no Richard Tauber; his passion and intensity is missing. ‘Your Sweet Rose-lips’ is heard from Theba in duet with honey-voiced Teresa Stratas as Princess Anna Lisa. Then come ‘Nobody Could Love You More’ and the rapturous solo ‘Love, You Heaven on Earth’. Mention must also be made of the charming duet for the comedian and soubrette (Pimpinelli and Bella) ‘For Once I Would Like to do Something Crazy’.